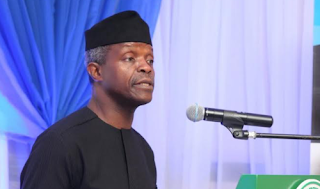 Vice-President Yemi Osinbajo says he will not stop talking about the corruption perpetrated under former President Goodluck Jonathan. He said this on Thursday at the 10th Bola Tinubu Colloquium in Lagos. He said the President Muhammadu Buhari administration is determined to change the negative perception about Nigeria. “Every time we talk about corruption, our opponent say, don’t talk about it, just do your own, don’t talk about it. The Yorubas have an adage, ‘When the conversation comes to a matter of tales, the frog will say let us skip that, don’t talk about it’. We will talk about it. The reason we will talk about it, is that we must let our people know we cannot afford to go this way again, never again should we allow his system where people take the resources of this country, and steal the resources of this country, used the resources against the people and at the same time they want to continue in rulership.